Why Scientists Are Teaching Dogs To ID Malaria From Sniffing Socks : Goats and Soda One scientist is training the ultimate disease watchdogs — canines that can smell the disease's parasites living inside a person's blood. 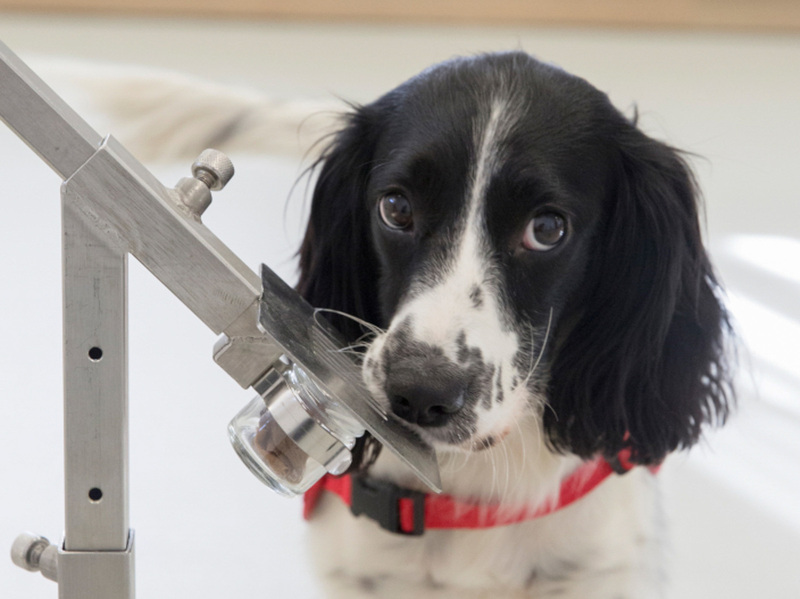 Freya, a springer spaniel, is in training to detect malaria parasites in sock samples taken from children in Gambia. Two canine cohorts were used in a study on malaria detection. Recent studies have found that people carrying malaria release a signature scent. "So I thought, 'Well, if a dog can smell fruits and vegetables in luggage, could they smell malaria in a person?' " Lindsay says. Then, as people hop off international flights, these watchdogs could take a few sniffs at each person's skin and paw at the people who might be carrying a parasite. "The person can be taken aside and possibly tested for the disease with a blood test," Lindsay explains. Clearly, larger studies are needed, Lindsay says. But the dogs' performance isn't too shabby when you look at how well some commercial tests perform. For example, one study found rapid diagnostic tests correctly detected malaria 60 percent to 90 percent of the time, depending on the particular conditions. And the tests correctly identified the negative samples about 90 percent of the time — which is similar to the dogs' performance. And Sally and Lexi have room to improve, Lindsay says. "We made it hard for the dogs," he says. "We didn't have many samples to train them with — just 30 socks worn by people with malaria. " "At the moment, malaria detection relies on taking a person's blood with a pinprick, but you can't do that to everyone coming across a border," Lindsay says. "The malarial dogs would be a noninvasive method of picking up the parasite." But there's still quite a bit a work to do before you'll find Sally and Lexi sniffing your legs at customs areas and baggage claims. For starters, the researchers don't know whether the dogs can actually pick up the scent on a person's skin in addition to their socks — and whether the dogs are able to differentiate between a malaria infection and an infection caused by another pathogen. Finally, Lindsay and his team haven't tested whether the dogs can detect different species or strains of malaria found in various parts of the world. Still though, if you think about it, the dogs are doing something remarkable, Lindsay says: They're detecting the presence of a microscopic organism living inside a person's blood — or liver — by simply taking a sniff of a sock.